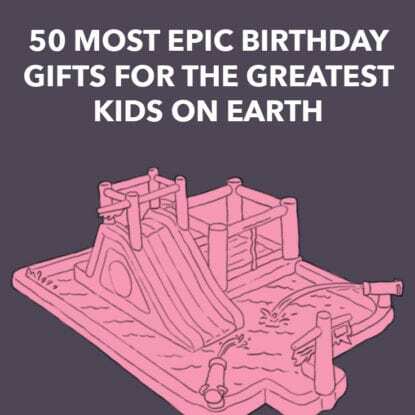 If you’re not sure what to send a little one on their birthday, or a special little boy or girl is sick and you want to let them know you’re thinking of them, these gift baskets for kids with toys, games and snacks are guaranteed to make them smile. 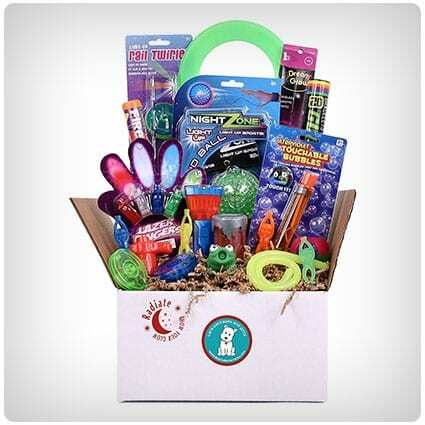 For kids who are night owls rather than early birds, this basket is packed with toys that glow in the dark – from a flashing rebound ball that attaches to their wrist to Glow Mars Mud (slime that can be seen from Mars), this gift set will light up their room after dark. If your teenage girl’s gone off to camp, send her this care package with everything she needs to get by (and make friends). The aromatherapy face mask will help her to relax, while the playing cards will make sure that everyone wants to hang out on her bunk. On birthdays, the calories don’t count. 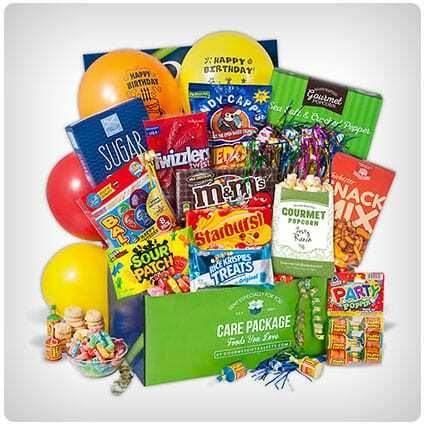 This care package is filled with sugar to make a kid’s day even sweeter – from M&Ms and Starburst to Rice Krispies Treats and Strawberry Twizzlers, there’s candy galore, as well as balloons, party poppers and party blowouts to get the celebrations started in style. Keep kids entertained on a long journey with this basket of snacks, puzzles, and activities – they can play mini board games as well as card games, such as Old Maid and Go Fish, while they snack on Cracker Jacks, Oreo cookies and Twizzlers licorice. Creative kids will love this care package that will keep them busy on cold, wet autumn weekends. There’s a Crazy Crayons gift set and Play-Doh for them to get stuck in to, as well as Rice Krispies Treats, animal crackers and Fruit Snacks to munch on. If you know a Minnie Mouse fan, you can stop the search for her birthday gift right here – this gift basket for kids includes original, licensed toys and accessories, as well as games and candy. You can even personalize it with a message just for her on her special day. Little divas won’t be throwing any tantrums after they receive this care package. There’s everything they need inside to feel like a star, including hair extensions, an emoji nail art kit, and a sleep mask, as well as sunglasses to avoid being snapped by the paparazzi. 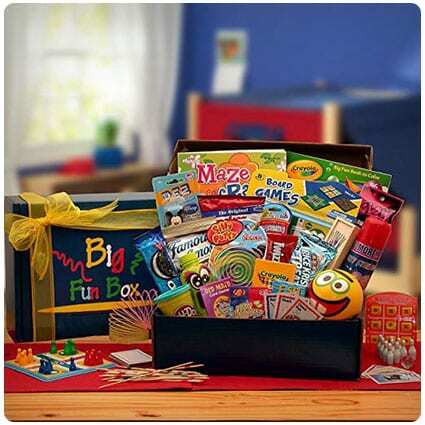 Distract kids while they’re waiting for Santa to arrive with this Christmas basket filled with activities and snacks – with 2 coloring books and crayons, themed playing cards and jigsaws, as well as treats such as Christmas lollipops and gummies, the Big Man will be here before they know it. All aboard for hours of fun. If you’re looking for a care package for a little one who’s been sick recently, this train-themed gift basket is sure to make them smile. Inside, kids will find chocolate, a sing-along song book and a plush teddy to hug while they recover. If they just can’t get enough of Disney Pixar’s Cars, kids will be racing to unwrap this themed gift basket. The toys inside include a puzzle, stickers, wrist band, and key chain, as well as candy for them to enjoy whilst watching the movie (again). Give your little superhero this Spider-Man basket filled with toys and accessories to help them save the day – from a watch that’s also their secret weapon to a tumbler to rehydrate after a fast-paced chase, it’s packed with everything they need to protect Gotham City. Little girls will go to the ball with this Disney-themed gift basket. With a brush for her hair, nail accessories, and stick-on earrings, she’ll look like a princess after getting ready, and she can doodle and write about the fun she had in her spiral notebook. Frozen fans won’t be able to get enough of this themed gift basket, which includes toys with their favorite characters from the movie. There’s a bracelet, nail accessories, and lip gloss so they can get glammed up like Elsa, as well as a diary and stickers. This bright yellow Minion will cheer kids up when they’re feeling blue. 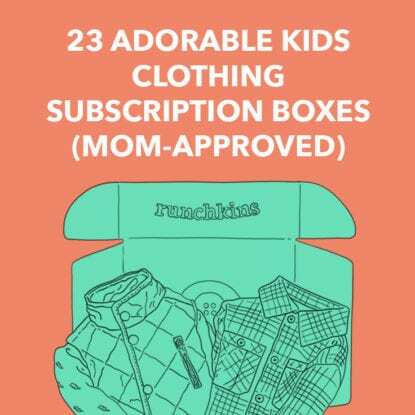 And best of all, the care package is filled with activities to keep them entertained when they’re stuck indoors, such as a coloring book and pencils and a treasure box with stickers inside. If a special little boy or girl is feeling under the weather, let them know you’re thinking of them with this care package – filled with their favorite snacks from Oreo cookies to Skittles, as well as Play-Doh and an activity book, it’s sure to take their mind off of being sick. For kids who always have a coloring pencil in their hand, this Crayola gift basket is filled with everything they need to get creative, including a coloring book and a pack of 24 crayons. There are also playing cards and Play-Doh, as well as snacks to refuel. LEGO fans will go mad for this Star Wars gift basket for kids – each one includes a LEGO Star Wars Millennium Falcon Microfighter Set with 92 pieces to keep little hands busy, as well as a 50-piece puzzle tin, an activity kit, and a sticker book. Tween girls can be difficult to buy for, but this gift basket will bring a smile to her face. With a ‘grown-up’ coloring book and scented pencils, lip balm, body lotion and even a bendy flamingo pocket pal, there’s everything she could want and more. Kids who are in to their dinosaurs will think that this care package, with hands-on activities and games, is RAWR-some. They can watch the dinosaur egg hatch or dig for dinos with their pals, wearing their matching friendship bracelets. After all, friends who excavate together, stay together. If you don’t often see a special niece, nephew, granddaughter or grandson, show them that you’re thinking of them with this Mickey Mouse care package – with a coloring book, playing cards, bounce ball and 11-inch plush toy, they’ll have hours of fun playing with what’s inside. If you know a little boy or girl who loves Marvel, you don’t have to pick just one superhero toy to give them for their birthday – this gift basket includes toys and accessories with all of their favourite Marvel characters, from Spider-Man to The Avengers. If your teenager only DMs you using emojis, she’ll love this fun care package – inside the emoji purse, she’ll find everything she needs to take with her whether she’s off to school or to meet friends, including a lip balm, highlighters, a notepad and candy. For kids who never sit still, this sports basket includes a foam football, a glow ball, bubbles and sidewalk paint to keep them out of trouble in the backyard. There are also snacks to help them reenergize after running around, such as Sunkist Smoothie Bars, Air Heads and Pixy Stix. Care packages are the gifts that keep on giving, filled with toys and activities. Check out this video for ideas on putting together gift baskets for kids who love art with a sketch pad, pencils and paints, or little ones who love going to the movies with DVDs, popcorn and snacks. Keep little fingers busy drawing, cutting and sticking with this DIY tackle box craft kit. Read this post to see what you’ll need – you’ll surprise yourself at how much fun you’ll have filling it with craft supplies, from ribbon to glitter glue (you could even let the kids help too). Kids can often be found hiding in the wardrobe, pretending to be spies – have a look at this post to learn how to create these easy dollar store spy kits to help them go undercover, including stick-on moustaches to change their appearance and lemon juice and Q-tips to write secret messages.